The Word Engagement Institute (WEI) and the Sustainable Capacity International Institute (SCII) collaborate with higher education institutions to facilitate connections and immersions with nongovernmental organizations in the global South. 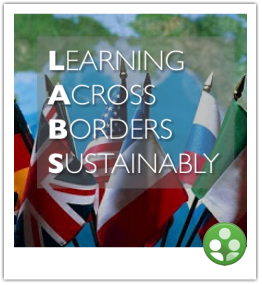 The Global LABS Programs give students in international development and related fields the possibility to positively impact organizations through internships, assessments and evaluations. The programs combine a hybrid university course (online and face to face) with a semi-guided international internship program in selected organizations and projects. Some programs also offer a WEI certification of participation in orientations and trainings offered by our associates. Dr. Marco Tavanti coordinates the program in collaboration with academic institutions and university programs investing in international engagement and global impact for sustainable capacity development. 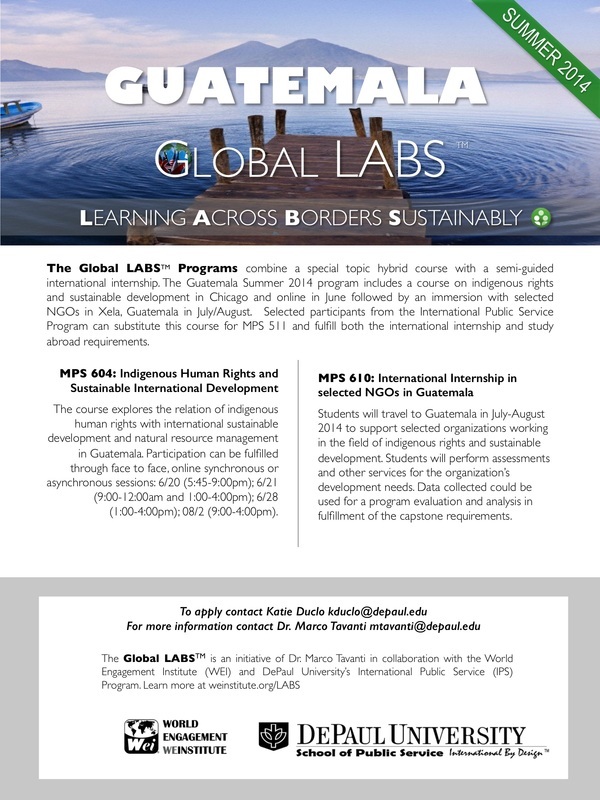 LAC PROGRAMS SERIES: The Guatemala programs (even summers 2014, 1016, 2018) include a course on indigenous rights and sustainable development in Chicago and online in June followed by an immersion with selected NGOs in Quetzaltenango (Xela), Guatemala in July/August. 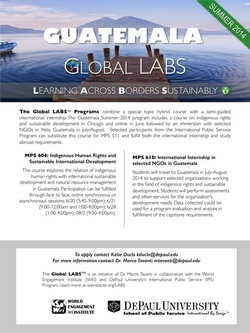 The course Indigenous Human Rights and Sustainable International Development explores the relation of indigenous human rights laws with international sustainable development and natural resource management in Guatemala. Participation can be fulfilled through face to face, online synchronous or asynchronous sessions. 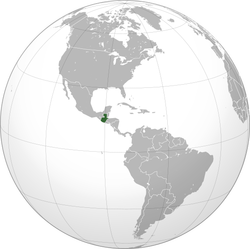 Students participating in the international internship component of the program travel to Guatemala in July-August to support selected organizations working in the field of indigenous rights and sustainable development. Students perform assessments and other services for the organization’s development needs. Data collected belongs to the organizations and can be used for the completion of reports and analysis for needs assessment, program evaluation, and impact analysis. EU PROGRAMS SERIES: The Italy programs (odd summers 2015, 2017, 2019) include a course, certification and internships in international Sustainable Food Policies and Organizations. In collaboration with Italian based iNGOs and the Sustainable Capacity International Institute (SCII-ONLUS), the program provides understanding and experiences in food security, food policies, food labeling and other food related topics in connection to sustainable development and sustainable human security. Rome is the headquarters of the United Nations specialized agencies dealing with food and agricultural issues: The Food and Agricultural Organization (FAO), the World Food Program (WFP) and the International Fund for Agricultural Development (IFAD). 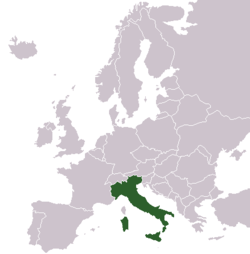 In addition, Italy is also well known for other food related international organizations such as Slow Food International, the Slow Food Foundation for Biodiversity, among others. The education of globally responsible leaders need to be integrated with international community development through academic impact in creative and collaborative programs. The critical role of higher education in economic and social development and as a foundation for world peace is widely acknowledged. [...] Academic institutions [should] make a commitment to use education as an engine for addressing global problems.